Indian NGOs in cahoots with their controllers in Washington and London are working overtime to prevent India’s rise as a major power. Like Putin did in Russia last year, India too needs to clamp down on their anti-national activities. The 21-page IB report reveals that “a significant number of Indian NGOs, funded by some donors based in the US, the UK, Germany, the Netherlands and Scandinavian countries, have been noticed to be using people centric issues to create an environment which lends itself to stalling development projects”. Further, in 2014 the NGOs plan to up the ante by targeting vital projects such as the Delhi-Mumbai Industrial Corridor, Gujarat’s Special Investment Regions and the Par Tapi Narmada River Interlinking Project. To be sure, this isn’t the first time the country has been warned about the ‘foreign hand.’ In February 2012, at the height of the protests against the Russian-built nuclear power station in Kudankulam, Tamil Nadu, former Prime Minister Manmohan Singh uncharacteristically railed against the protesters, saying India’s atomic energy programme had got into difficulties because of mostly US-based NGOs. After the PM’s accusation, the Home Ministry didn’t waste any time in freezing the accounts of four NGOs, including an Indian Christian group, Tuticorin Diocese Association. The problem with NGOs is that it’s hard to tell the good from the bad. Take the People’s Union for Civil Liberties (PUCL), the country’s largest and oldest human rights group. PUCL was mentored by none other than Rajindar Sachar, a retired high court judge, who shot to fame after he headed a committee that filed a report about the state of Indian Muslims. The 10-year long rule of Sonia Gandhi and her proxy Manmohan Singh hugely facilitated the rise of Western NGOs, especially church groups in India. In 2010 Tehelka magazine produced an exhaustive report on the American penetration of India via evangelist groups. 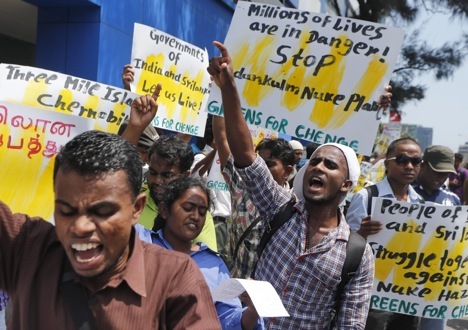 There’s no rocket science to handling NGOs. The Russian solution is to simply label NGOs involved in political activity as “foreign agents”, which is fair enough as they are clearly acting in the interests of a foreign state. This does not necessarily mean they are foreign agents. To some that might sound harsh but such labeling is useful in keeping a close eye on potential fifth columnists. At any rate, the law is inspired by American policies. In the US, similar NGOs have to file a report of their activities every six months, produce copies of all their contracts and even verbal agreements with outfits they work for. Recent Russian history suggests such measures are indeed necessary. It is well known how the likes of Washington, London and Brussels poured billions of dollars into post-Soviet Russia to bribe officials and politicians in order to engineer a government that was subservient to the West. The corrupt practices of Western businessmen and politicians shamed even the most hard-boiled Russian criminals. The West succeeded in making inroads into the Kremlin and installing its puppets such as Andrei Kozyrev, who in fact refused to meet Indian Prime Minister P.V. Narasimha’s envoy Mani Dixit in Moscow, disdainfully saying Russia would henceforth not treat India as a special friend. The consequences of that snub are being felt even now – by the Russian defence industry, which has seen many Indian contracts go to US firms. The Americans must have got cramps laughing at Kozyrev’s naivete. Let’s not forget that it was the United States Commission on International Religious Freedom, a US-funded agency working with Indian NGOs, that was responsible for the US visa ban on Prime Minister Narendra Modi. It was a churlish act that also tarred India by implication, a snub for which India must demand a US apology. To be sure, there are tens of thousands of NGOs that are not in the pay of the West. But there are others like Citizen Initiative, which played an active role in tarnishing Modi’s name while working for their Western masters. They need to be watched, warned and then stopped.